There's a really awesome interview with BSG composer Bear McCreary that you can listen to at Film Music Radio.com. The program runs for an hour and a half. TV Squad has a short review of Downloaded. Matt Roush in TV Guide says Downloaded "is one of the best hours of TV in any genre you're likely to see all year. So many twists and revelations, including a welcome return to the Cylon-occupied planet of Caprica. It's smart, suspenseful, surprising  just a wow of an episode." The season 1 two parter, "Act of Contrition" and "You Can't Go Home Again" have been nominated for the Nebula award. BSG Media has some spoiler promotional photos from "Lay Down Your Burdens, Part 2". Dave Mason of the Scripps Howard News service has a review of episode 218, Downloaded, and Jonathan Harrop in The Arkansas Traveler writes about Battlestar Galactica, in general. Also Ron Moore's podcast has been updated with commentaries for The Captain's Hand, and Downloaded. And David Eick's video blog, installment 18, about the show's props, is now online. Katee Sackhoff interview in Time Out New York. Now Playing Magazine has an excellent interview with Ron Moore. Ron talks about the next episode "Downloaded", discusses the Battlestar Pegasus, and the issues of stem cells and abortion that the show has recently raised. I really like this promo for Bear McCreary's Galactica music. If you haven't seen it yet, check it out. Ron Moore's podcast for the episode tonight, "The Captain's Hand" has been delayed. David Eick's video blog has been updated with a behind the scenes look at a tone meeting. And the podcast, Sci-Fi Talk has an old intereview with Andreas Katsulas. Sci-Fi Talk also has a recent interview with Richard Hatch. I thought "Sacrifice" was a pretty good episode. Not terrible, but not great either. For the most part it seemed built around the notion that they had to have a good way to kill off Billy. Still, there were enjoyable aspects. D. rejecting Billy's proposal was an interesting touch, so that now that Billy is dead D. and Apollo can go through some guilt, as their relationship progresses. 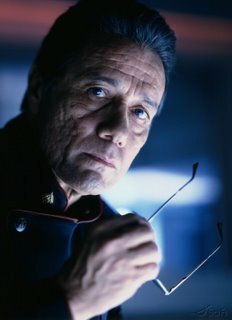 Edward Olmos as always delivered. Ron Moore in his podcast noted that Eddie improvised the line at the end of act 3, "Cut the wire," and that they don't even know what it means, but they liked it. I like it too. Knowing that he improvised it, makes it rather funny as well. Sometime Edward James Olmos should be part of Ron's podcast, or do an actors commentary track for the future DVD release of some BSG episodes. I'm sure his insights are very interesting. Also in Ron's podcast, he said that this was not one of his favorite episodes, but not as low on his list as Black Market. Well, it's certainly better than Black Market. Though, I'm not sure if I can explain why I like it. Maybe it was seeing Kara in civies. And it's nice to see that off-duty Marines wear Hawaiian shirts, just like if they were on leave from Pearl Harbor, or something. So, "Sacrifice" -- a strangely entertaining episode. I was never trilled with the original look of this blog, which had been selected from one of the many boring templates on Blogger. So, I snooped around and found a nice elegant WordPress style blogger template, and I hope you like it as much as I do. I also corrected an oversight of mine, and have adjusted the commenting to "anyone" status, so to comment you don't need to have a Blogger account. Galactica Sitrep 008 is now online. I encoded it as a mp3 for people who wanted it as an mp3 instead of AAC. You can get the podcast from the iTunes, or the XML feed link to the right of this page. My new podcasting microphone will arrive tomorrow. Here's a look at the Studio Condenser Mic with USB Output - SAM C01U. 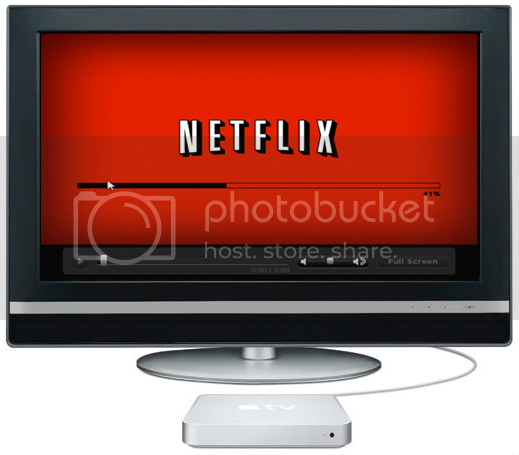 So I hope that will vastly improve the quality of the podcast. Update: The mic arrived, and is excellent. I've done some test recordings, and it sounds great. I think everyone will be happy with the results. ...Now, I just need to get over my cold. It looks like Lucy Lawless will be a member of the cast of season 3 of BSG, as a semi-regular, for ten episodes as the cylon/reporter. Entertainment Weekly has a great review of Battlestar Galactica. Ron Moore's podcast for Scar is now online, with additional commentary by writers David Weddle and Bradley Thompson. Rolling Stone article on BSG. Ratings drop for Black Market. Spoilers for the rest of season 2. Ron Moore on Abe Lincoln. Jamie Bamber and Tamoh Penikett in Sci Fi Pulse. I found a nice detailed shot of the painting in Adama's quarters, above his sofa. 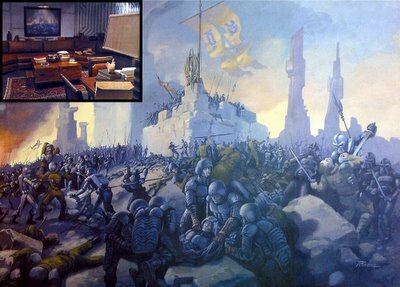 I believe that in the season 1 episode, Bastille Day, Baltar noted the name of the artist, or the title of the painting.